We have published several previous reports covering the rise in demand for graphics cards for cryptocurrency mining and the impact that is having on the industry and consumers. Of course, this heightened demand is good for the companies that make GPUs, they simply can’t make them fast enough, and that has been the case for months. 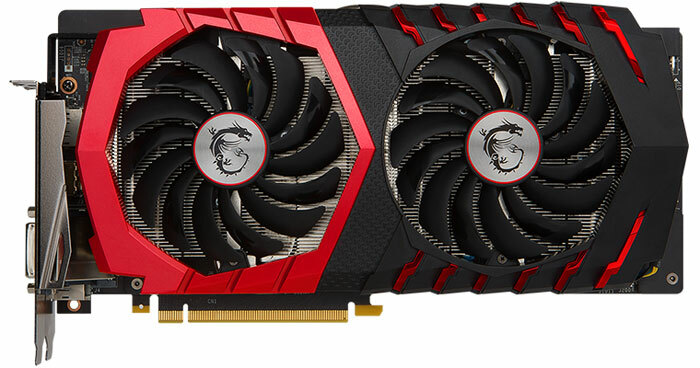 However, the target market for most of the GPUs being gobbled up by the miners is that of PC gamers and enthusiasts, and they would like things to change as many graphics cards are selling for more than double their MSRP. Back in June last year we saw the first Mining Edition graphics cards released by the likes of Asus and MSI. If the idea was to free up gamer targeted GPUs then it hasn’t been seen to work. A brief blip in the main cryptocurrencies value ascent in July gave us some hope but of course that’s ancient history. 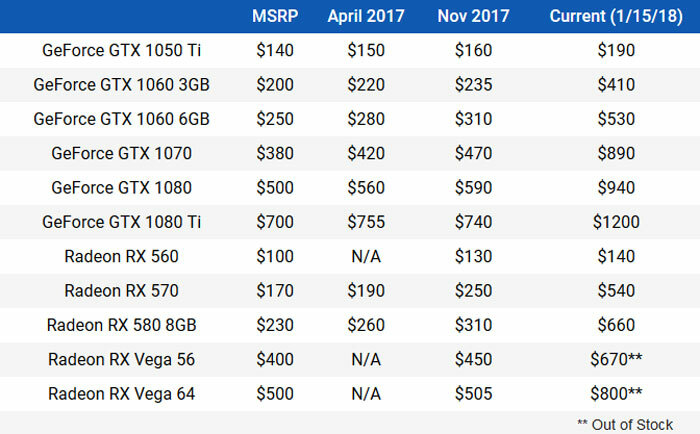 Pricing chart compiled by TechSpot. Showing the impact in MSRPs over a wide range of consumer graphics cards, TechSpot put together the table above. The pricing impacts will be similar around the world – in your local currency – with some slight variations. Standout price rises are seen with the GeForce GTX 1060 6GB, GeForce GTX 1060 6GB, Radeon RX 570, and Radeon RX 580 8GB. Furthermore it was noted that Newegg, a major US e-tailer, is doing nothing to discourage miners, selling GTX 1080 cards in six-packs. the MSI model above was considered pricy with its £300 launch price tag. German site ComputerBase.de received a statement from Nvidia about the pricing problems for gamers and the state of the market. The statement is reproduced below. Nvidia is asking retailers to follow in its footsteps with actions like limiting the number of graphics cards ordered per customer. It will be interesting to see if this ‘directive’ will have any influence on the market. In related news the cryptocurrency miners might, like back in July, again decide GPUs aren’t the best tool for the job depending on other mining solutions and where values settle in the coming weeks and months. So Nvidia's answer is to ask retailers to play nice. Well that's going to work isn't it. It's like asking a thirsty person to drink less water. Never know, output keeping up with demand just might help. Yeah right Nvidia, not when the retailers can milk the shortage. They don't care who buys it as long at they have the momney in the till. The Msi 1080ti was listed as £750 over a month ago, and that was high enough as it is. Now, same card £899 because it's “in stock” whilst several retailers have it on back order for £720. Easy to say it's for gamers when the retailers are the criminals themselves. Not sure output can. Crypto currencies are like a electricity eating cancer that make GPUs look like money printing machines. If more money printing machines are released on the market, what would stop people from buying them as well? If GPU production went up a magnitude I doubt it would help gamers, but it might lead to rolling blackouts from electricity used.